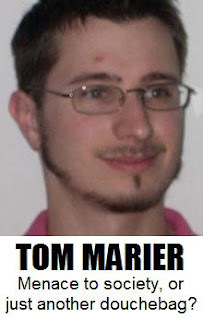 Trying to generate some traffic for his latest post at The New Majority, Thomas J. Marier sent me an e-mail: "I humbly request that you denounce me by name in the strongest terms possible." In my efforts at mentoring young intellectuals, I'm always happy to help a vicious Trotskyite douchebag who deserves to be shipped off to Gitmo in chains. That made me cry just a little bit. Tears of joy. you brain-dead invert. Remind me -- when you buy me beers at CPAC -- that I need to create a Stacy McCain Automatic Ad Hominem Generator. Haha, that was freaking hilarious!